30 years, 10 months, 14 days old age. Ajinkya Rahane will turn 31 on 06 June, 2019. Only 1 months, 16 days, 21 hours, 25 minutes has left for his next birthday. Ajinkya Rahane has celebrated the total number of 30 birthdays till date. See the analysis by days count and bar graph. 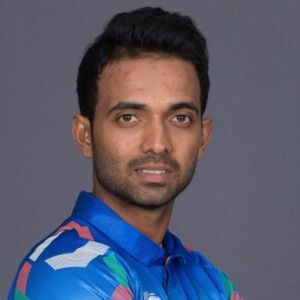 Ajinkya Rahane was born on 06-06-1988 in Ashwi KD, Ahmednagar in the state of Maharashtra, India. He is an Indian Cricket Player. Ajinkya Rahane is a young Indian international cricket player. He completed his school level education from SV Joshi High School in Mumbai. He was spotted very early by former Indian batsman named Pravin Amre and decided to coach him. He first came to recognition after he struck two double hundreds in 2007 while playing for India U-19. After which, he made his first-class debut by representing Mumbai and scored a fine hundred on his debut match for Mumbai. His heroics earned him a place in the Irani Trophy. After a series of fine performance and injuries that ruled out some of the key players, he was drafted into the Indian team which toured England in 2011 after the World Cup. He was among the few bright spots for team India in an otherwise dark tour. He though couldn’t cement his place permanently and remained in and out of the playing 11 until 2013. He finally made his test debut for India against the visiting Australian side in 2013. He was then drafted into the team that toured South Africa in 2014. He played some fine knocks there and more or less this tour cemented his place in the longer formats of the game for sure. After which he performed well on all the overseas tour and has been India’s answer to fill the shoes of the likes of Laxman at number 5. Though, he has a long way to go before his name gets compared with such greats of the game. However, he didn’t have a same going in the shorter format of the game. He has always been included in the 15 member squad but hardly finds himself a place in the playing 11 until one of them Rohit Sharma or Shikhar Dhawan are absent. In the limited chances that he has got as an opener, he has proved that he has it in him. His selection though as of now will depend only on the form the currently established openers. If they are doing he well, he will have to make way for them. After Virat got injured for the final test against Australia when they toured India in 2016, he was named the captain of the team and won India a match on his debut as a captain. He though had some experience of captaining the side when India toured Zimbabwe in 2015. In IPL, he was included in Rajasthan Royals' squad in 2008 and played for them until the franchise got banned in 2015. He had an outstanding career thus far and since Indian team is scheduled for a hefty overseas tour in the coming season, he certainly has a huge role to play. He was born to Madhukar Baburao Rahane and Sujata Rahane. He has a younger brother named Shashank Rahane and a younger sister named Apurva Rahane. He is married to Radhika Dhopovkar since 2014. Rahane who is known for his solid batting technique and his superb fielding skills has also got a black belt(in Karate) to his name. He along with the 'wall' of Indian Cricketer Rahul Dravid who also made his T20 debut in the same match announced his arrival on the big stage.Rahane scored quickfire 61 runs in 39 balls. He is the first batsman to hit six fours in an over in a T20 match. Rahane hit six fours against Sreenath Arvind of Royal Challengers Bangalore in the IPL 2012. He has been the most successful player for Team India and it was due to his hard work and his love for the game that he was awarded the CEAT Indian Cricketer of the Year Award in 2016. He has also been conferred with the Arjuna Award. India has never lost a Test match when Rahane has scored a century, which makes him a vital part of the Indian squad.